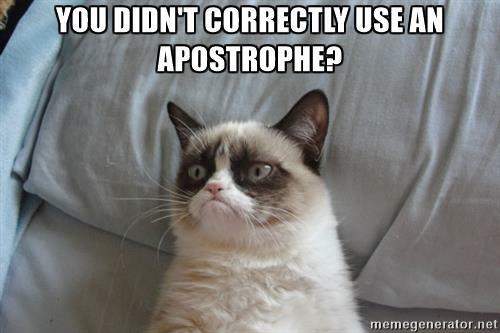 Grammar tips: Apostrophes Grammar tips: Apostrophes - HGR Inc.
Did you know that Aug. 16 is International Apostrophe Day? We’re celebrating early because we all could use a little grammar refresher to dust off the cobwebs that have accumulated since grade school. Let’s get to it! Apostrophes are a lot like commas and hyphens in the sense that they are a mark of punctuation that many people do not know how to use properly; so, we throw them in where they don’t belong and leave them out where they do belong. Usually, this happens when forming plural words or when showing possession, but I see it with contractions. Another tip: Make sure that you’re using the correct word in your writing because often they’re misused when you confuse their with they’re and you’re with your or it’s with its.